The following rules influence Player bidding at HCL: •The Category of Players to be auctioned are: Men Players to include GMs, IMs and Rated Players; Women Players to include WGMs and Women Rated Players. (As logical, Rated Players also denote to GMs, WGMs and IMs). • Each team has a total maximum kitty of Rs.3.5 Lakhs from which it is mandatory to bid for a minimum of 6 players with 2 women players mandatorily. This should include minimum 1 GM, 1 IM, 1 WGM, 1 Woman Player and 1 rated men player. If managed well, the Franchise may bid and acquire as many players as possible. • The auction is conducted according to the category (GMs, IMs etc) and within the categories, order that players will be presented for auction will be determined by a random draw that will take place in the Auction room, and the auction will move on for the next category only after all the players of a particular category are auctioned. This is going to be interesting! If the highest rated player in a particular Category will not come up for auction till the end, the teams may not bid for anyone till then! • There is a base price quoted by each player who has registered – see the registered players with their base prices. Incremental bids in each category will be Grand Master – Rs. 5000/- , Women Grand Master and International Master – Rs. 3000/-, Women and Rated Player – Rs.1000/-. • *Spoiler Alert* Three Categories of players will be bid very aggressively in the Auction this year: Maharashtrian WGMs, IMs and non-titled players! • Because, each team will have to play at least 3 players from Haryana in every round, apart from fielding 2 Women players. So, it doesn’t matter how many Haryana or Non-Haryana you have in your team: you will have to play 3 from the state in every round. This leads to lots of thinking and strategies behind the bidding process. 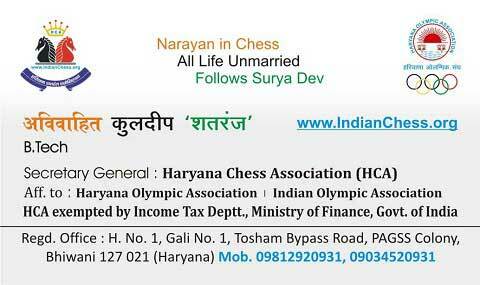 Just a few examples: • There are lesser number of Grandmasters from Haryana, compared to the IMs and WGMs. So, during the auction, teams will first bid aggressively for GMs, WGMs, and IMs from Maharashtra. The logic is that, if they get any of these three, they can pick up another GM or WGM from another state for a cheaper price later on, and can thus pick a strong team. • If you are lucky enough to `catch’ a GM or WGM from Haryana first, then you can pick another GM or WGM from another state for a cheaper price, thus loading your team with titled players. • While bidding for stronger players, you will also have to keep in mind that, he can also bring maximum 1 point round, which can also be brought by a strong non-titled player. So, instead of spending too much of your kitty on a strong GM, you can go for modest rated players in the GM category, and aggressively bid for untitled players among men and women from Haryana later on. 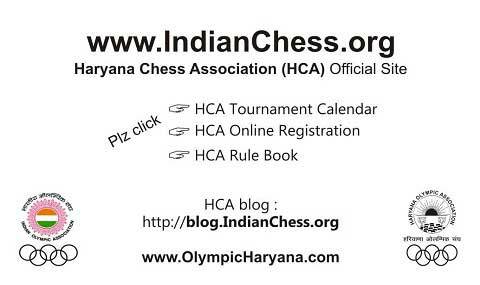 Haryana Chess League is a tournament which will be organized in the eam Championship format in Bhiwani from 11th to 15th June. The aim is to spread the game of Chess and to develop young talent by making them compatriots of GMs and WGMs in the same team. Eight teams from different cities will compete with each other in a round robin format followed by semi-finals and finals. Each team will consist of 5 players, with a minimum of 1 Sub-Junior, 1 Junior, 1 Senior, 1 Woman and a other Player. Each team will be allowed to spend Rs. 3,50,000/- on buying the players. Players, from all over India and having various titles, will be auctioned off and bought by teams. Every player will have a base price at the auction, as declared by themselves. The team owners will be taking care of the travelling, lodging and food expense during the tournament. The players participating in the tournament will have a great opportunity to show case their talent at such a big stage. They will be associated with teams which will be owned by big and famous companies. It will be a great chance for young and talented players to gain precious knowledge and experience by playing in such a big tournament along with GMs and WGMs.